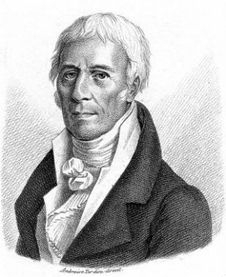 The French biologist Jean-Baptist Lamarck (1744–1829), whose research preceded that of Charles Darwin, advanced a theory of inheritance later termed Lamarckism. This proposal suggested that animals passed on acquired characteristics to their offspring by altering their own genetic makeup. In the evolution of the giraffe’s neck, it was believed by Lamarck that individual animals would stretch and stretch their necks during their lifelong quest for food, and that those acquired characteristics would be passed on to their offspring. Conceptually, the giraffe is believed to have evolved a long neck directly because of the need for a long neck to obtain food. Therefore, a need would directly enhance the probability that a given characteristic would appear in the population, according to Lamarck. Charles Darwin did not rule out the possibility of Lamarckism in formulating his theory of evolution. During Darwin's day, many biologists believed that for evolution to be plausible, inheritance must be as Lamarck described. Had such been the case, Darwinism would be much easier to accept as a valid theory. However, laws of inheritance known today prohibit the transmission of acquired characteristics to offspring. The early acceptance of Darwinism by many nineteenth century biologists was heavily reliant on the assumption that acquired characteristics could be passed to offspring. Proposed evolutionary pathways were justified by the assumption that the environment itself could prompt evolution directly. In imagining the evolution of a whale from a land mammal, it was assumed that the changes that took place were caused directly by an oceanic environment. This was assumed because it was inconceivable that gradual changes occurred by chance alone. In Origin of Species, Darwin relied on the validity of transmission of acquired characteristics to justify some of his evolutionary proposals. This early prediction of evolution has been scientifically refuted. The documented impossibility of Lamarckism is a profound blow to the theory of evolution. Recently interest in Lamarckism has increased, particularly in reference to acquired behavioral characteristics from parents. However, a great deal of caution is used to avoid the infamous word "Lamarckism", because no one is proposing that actual changes in genetic code are possible through acquired traits. As biologists in the past saw the necessity of invoking Lamarckism to justify a belief in evolution, man's ever-increasing understanding of the complexity of life has prompted many to revisit concepts that have been proven to be biologically impossible.